The desire to have fairer skin has dominated the cosmetic market over the years because everyone wants to look good and feel good! 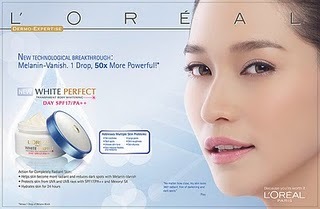 Having fairer skin is essential to boost confidence level and pride. Now at midlife, I want to show the world that my age is just a number and feeling good transcend all ages! Like Earthlingorgeous, I want 50x more fairer skin! Thanks to Loreal, I can hit the road with verve and style 50x more! Join in Earth Rullan's contest and be one of the 5 winners of P5000-worth of beauty products. Winning entries will be announced on the 2nd week of December 2010!